Five Anti-Acid Juice Recipes That Will Prevent Inflammation that Leads to Heart Disease and Cancer! Heart disease and cancer are currently categorized as the top two health conditions that have claimed most lives in the world. 95% of heart disease and cancer is a result of what one eats, drinks and thinks. Only 5% of all heart attacks, strokes or cancers are genetic. In fact, that 5% is triggered by what one is eating, drinking and thinking. Therefore, 100% of all sickness and disease is a consequence of what you eat, what you drink and what you think. You decide your own health, energy and vitality or your sickness and disease with your thoughts, your words and your deeds. The presence of unhealthy or cancerous cells in your body is NOT permanent because it depends on you, your lifestyle and dietary habits that determines whether or not a healthy cell becomes inflamed, degenerative and cancerous. The health of your body cells that make up all your tissues, organs and glands is determined by the environment they reside. Therefore the human body cell is only as healthy as its alkaline environment. Bottomline, you are alkaline by design and acidic by function. Breathing, thinking, eating, drinking and moving all produce acidic waste products if NOT eliminated via the four channels of elimination will buildup and damage healthy body cells causing them to become unhealthy or cancerous body cells. You see, inflammation is caused by acidity and inflammation is the spark that ignites all sickness and disease, including a heart or cancerous condition. 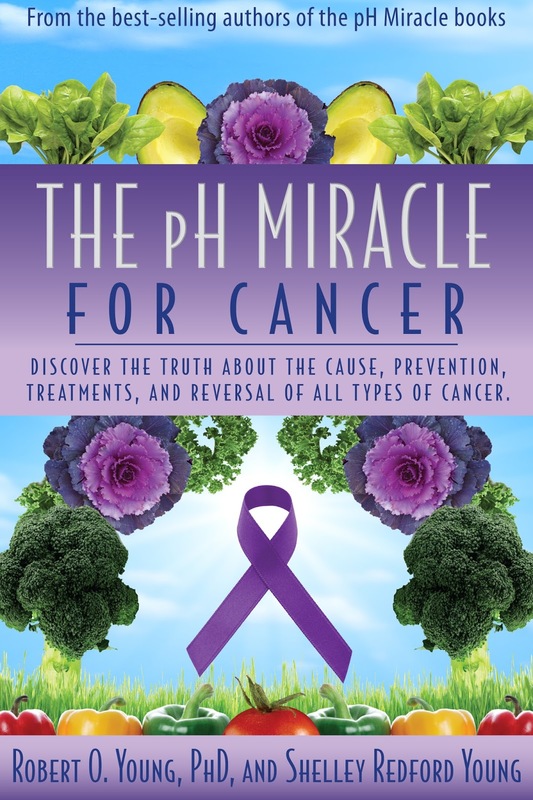 It is important to recognize that preventing and reversing a heart or cancerous condition can only happen when you are willing to embrace an alkaline lifestyle and diet. To help you on your journey for extraordinary health and vitality free from all sickness and disease, including heart disease and cancer, I want to share with you a list of alkalizing juices that will support you on this journey! To prevent the onset of an acidic condition juicing and/or eating sliced cucumbers with sea salt, parsley, kale and spinach is recommended. These ingredients perform various inputs of nutrients to the body, such as vitamin A, B and E and various minerals such as magnesium, potassium and calcium. 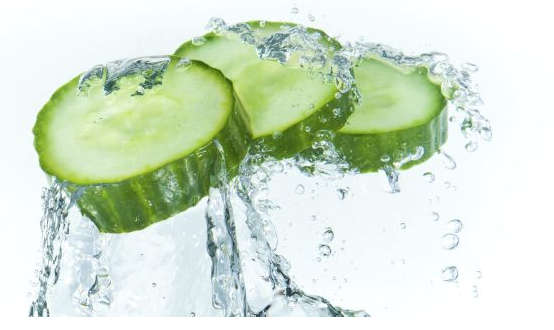 Cucumber ½ pound (225 g), 2 glasses of alkaline water (400 ml), a bunch of Parsley, and a handful of Spinach. Juice half or a lime or lemon for for taste. Juice in a Green Star Juicer or blend in a Vitamix blender to achieve a liquid or pureed state. Cabbage is an alkalizing vegetable that provides many alkalizing nutrients, including magnesium, potassium and vitamin C. It is therefore highly recommended as a key ingredient to the prevention and/or reversing a cancerous condition and its effects on human health. Liquefy green, yellow and red cabbage with alkaline water. If you want to minimize the bitter taste you can be add lemon, lime and/or cucumber juice. You can also add broccoli for increased antioxidants in buffering dietary and/or metabolic acids. 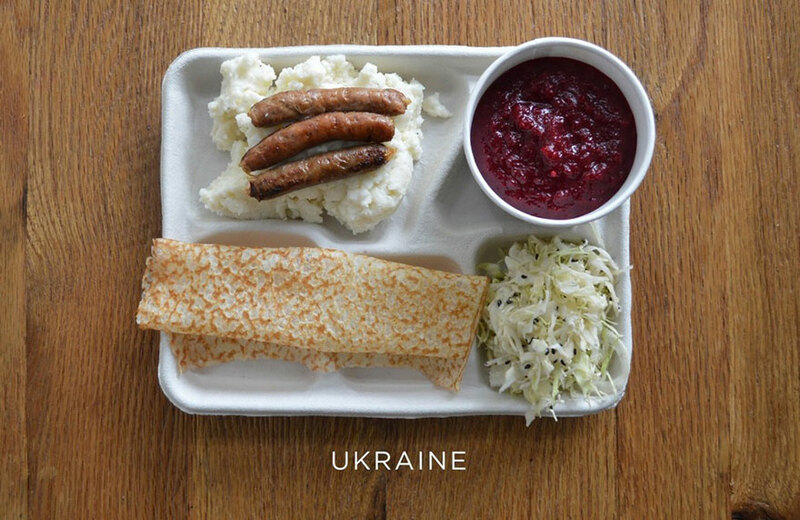 As mentioned above, cabbage is a beneficial food in the prevention and/or reversal of a cancerous condition. Add other ingredients that will provide the body with alkaline nutritional properties that will buffer the acids that cause cells to become cancerous. You can blend with the green ingredients juice with 1 avocado. Unprocessed natural sea salt can be added to taste. Note: Juice fasting, to make better use of their properties is recommended. Tomato juice is also recognized as an effective way to prevent inflammation, heart disease or a cancerous condition. Tomato has a broad antioxidant or anti-acid phytonutrient called lycopene, which has been shown through various studies to be a substance that prevents cellular transformation or spoiling and rotting of body cells. Blend all ingredients in a Vitamix blender and add basil for flavor. Finally, a juice made from cucumber, tumeric, ginger and lemon that contributes to minimizing the presence of metabolic and/or dietary acid that causes inflammation leading to a heart or cancerous condition. Ginger is listed as one of the most anti-acidicfoods that exist, so I highly recommend its use. Moreover, this is a drink that provides energy to the body, while having anti-inflammatory, antioxidant and soothing/calming properties. Why? Because it is a powerful anti-acid of dietary, respiratory, environmental and metabolic acids. 1 to 2 cucumber, liberal amounts of turmeric, some ginger and lemon or lime with sea salt to taste. Juice the cucumber first, then add turmeric, several roots of ginger, 10 leaves of mint with lemon and/or lime to taste. The effectiveness of these juices lies in the concentrations of anti-acids or antioxidants that buffer acids and alkalizes the blood and then interstitial fluids that surround the cells preventing and/or reversing inflammation that leads to a heart or cancerous condition. Several studies have been conducted on the issue of heart and cancer dis-ease and how to prevent or treat these conditions, and have yielded positive results that an alkaline pH in interstitial fluids preclude the development of acidic or unhealthy body cells. Therefore, if you want to prevent and/or reverse a health challenge start focusing on the fluids of the body and the cells that make up your tissues, organs and glands will adapt to that healthy alkaline environment! 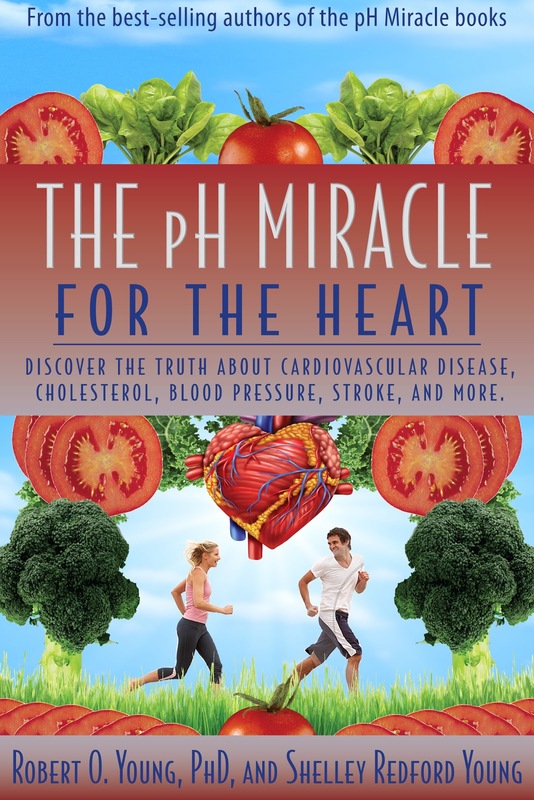 The pH Miracle for Heart Disease – Discover the Truth About Heart Disease, Congestive Heart Failure, Atherosclerosis, Cholesterol, Hypertension, Stroke and More! According to my theory ALL of the symptoms or conditions of Heart Disease are ALL the result of an excess of dietary, environmental, respiratory and/or metabolic acid that have not been properly eliminated through the four channels of elimination. The four channels of elimination include urination, defecation, respiration and perspiration. When metabolic and/or dietary acidic waste is not eliminated through the four channels of elimination they are either solidified by the body with alkaline compounds or pushed out into the connective and fatty tissues away from the organs and glands that sustain life. Acidic metabolic and dietary waste when not eliminated from the blood or lymph fluid is solidified and buffered with alkaline compounds such as sodium, potassium, calcium and/or LDL cholesterol forming plaque or acid crystals that build up on the inside of the arteries, veins and lymphatic vessels. Plaque is made up of alkalizing fats, cholesterol, calcium, sodium bicarbonate, potassium and other alkaline substances found in the blood and interstitial fluids. Over time, acid bound plaque hardens or crystallizes forming a solid mass and narrows the arteries, veins and lymphatic vessels as seen in this picture. The flow of oxygen-rich blood and alkalizing compounds to the tissues, organs and glands that sustain life is reduced due to the narrowing of the blood and lymph vessels. The restriction of blood and lymph circulation and the build-up of metabolic and/or dietary acids can then lead to tissue, organ and gland ulceration and/or degeneration causing a stroke or heart attack leading to heart failure and sudden death. Heart Disease is Epidemic – Something Has Really Gone Wrong! Today over 25% of the US population takes expensive and highly acidic statin medications and despite the fact we have reduced the fat content of our diets, more Americans will die this year of heart disease than ever before caused by acidic drugs and acidic lifestyles. No health topic is more important, more full of misinformation, and more complex than understanding the cause and effect relationship between inflammation and cardiovascular disease. This article tackles the four most common conditions associated with inflammation and “heart disease”, including all of its symptomologies: hypertension, stroke, coronary heart disease, and congestive heart failure. I believe the information herein will be life changing and life saving for all heart dis-ease problems. Cardiovascular or heart disease is the number one killer in the United States, and yet it does not induce terror or fear as cancer does. The reason for this is because people are horrified of the acidic cancer treatments or chemotherapy, radiation and surgery and NOT the disease itself. Alas, heart health is frequently ignored in lieu of cancer concerns, with breast cancer being an excellent example of this short sightedness. Case in point: For every woman who dies of breast cancer or from the cancer treatments (70 percent or higher) 11 more will die from coronary heart disease. About 60% of heart disease deaths happen suddenly in people who had no previous symptoms and normal LDL cholesterol levels. These people simply collapse unexpectedly. The real lesson here is to be educated, as you will see. 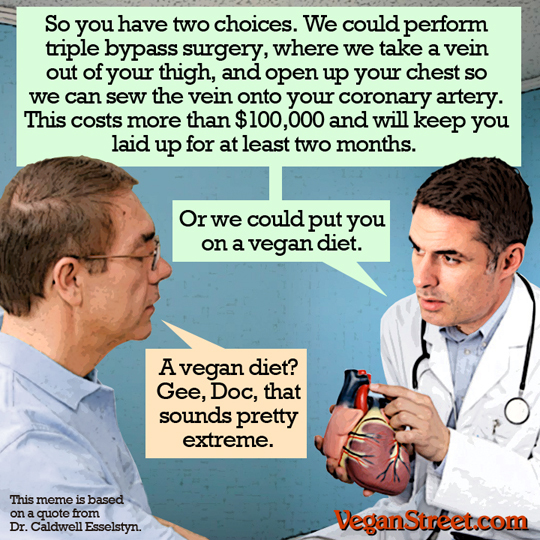 Everything that we have been taught about cardiovascular/heart disease is WRONG! That’s right EVERYTHING! If the so-called experts whom many of us have been listening to were right, than cardiovascular/heart disease would not be the #1 failure of modern-day medicine. Adhering to a critical holistic principle of non-invasive alternative medicine or true health care, it is important that we never adopt the foolishness of a typical physician, who will obsessively focus on only the organ displaying obvious symptoms. It is wiser to treat the whole patient instead of an organ, which means correcting problems with both lifestyle and diet. As is the case for practically all other chronic dis-eases! A heart patient usually brings the dis-ease upon himself or herself with his or irresponsible acidic lifestyle behavior for a period of many years, and only he/she can get himself/herself out of this acidic mess. Acidic toxic drugs can suppress symptoms for a while, like they do, but real change comes only from real changes in what you eat, what you drink and what you think. Merely masking the symptoms with toxic acidic drugs is the health policy of fools. The time bomb for a heat attack or stroke is still ticking, even though the timer has been hidden from view with useless modern-day big Pharma drugs. 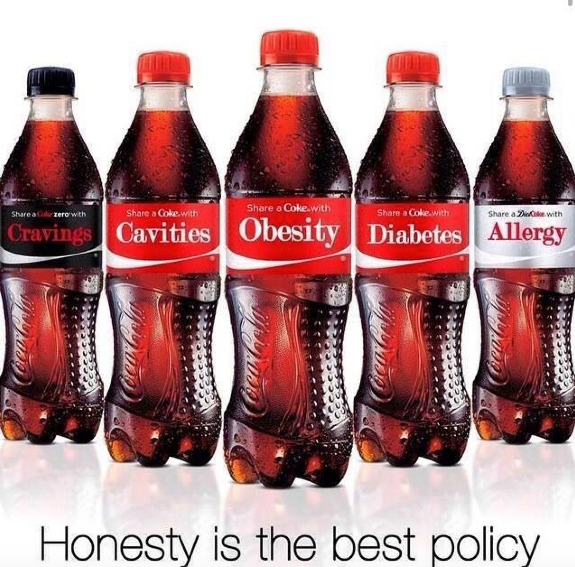 95% of ALL sickness and disease is caused by what you eat, what you drink and what you think. 5% of ALL sickness and disease is caused by genetics which is expressed or triggered by what you eat, what you drink and what you think. 100% of ALL sickness and disease is caused by what you eat, what you drink and what you think. Therefore all sickness and disease is caused by the over-acidificaiton of the blood and then tissues due to an inverted way of living, eating, drinking and thinking. 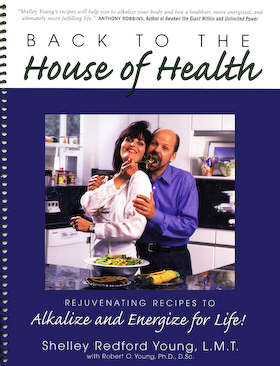 The prevention of ALL sickness and disease is achieved by following an alkaline lifestyle and diet. It is that simple. 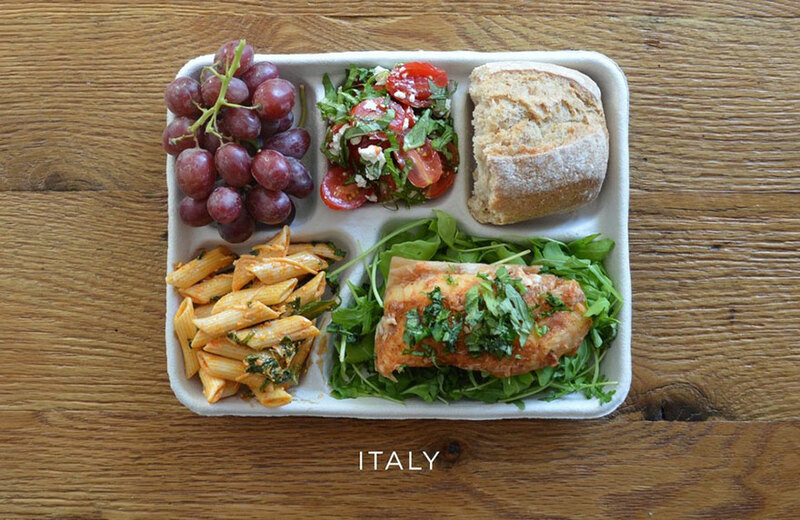 The following video was produced by Children’s Healthcare of Atlanta to educate people in re-thinking their acidic lifestyles and diet or eating living and eating habits. The video depicts a man whose life “flashes right before his very eyes, unhealthy acidic dis-ease causing habits and all,” Children’s Healthcare of Atlanta posted online. 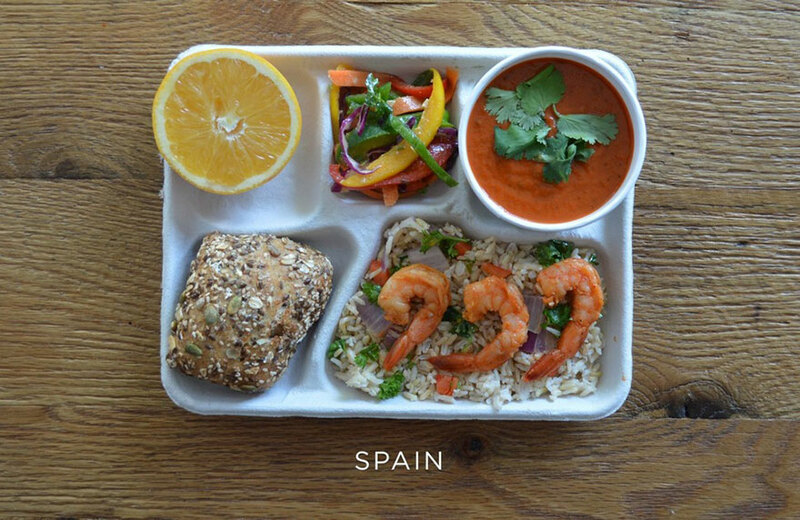 “You’ll get a shocking sneak peek into the future to see what life might be like for a child who carries unhealthy acidic lifestyle and eating habits into his adulthood.” The choices parents teach their child today become the habits they will take into their adulthood with all the associated dis-eases! What is the one toxic acidic living, eating or drinking habit you wished you never picked up? 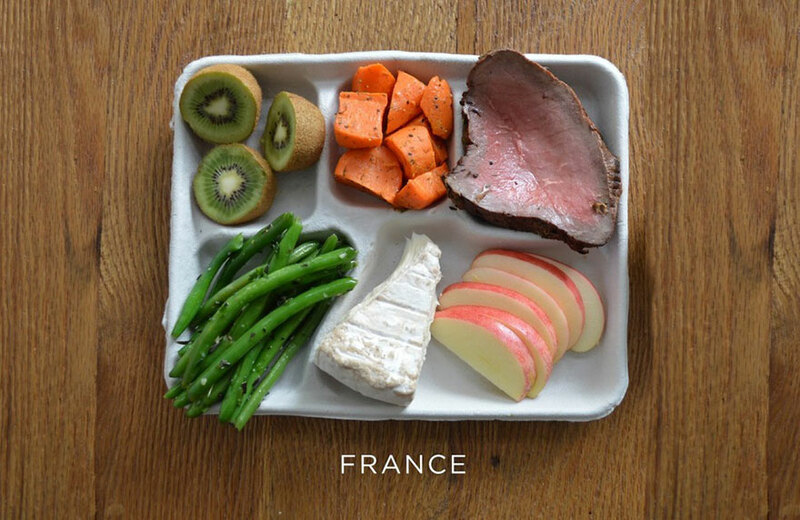 Here is what acidic school lunches looks like around the World which are making our children sick, tired and fat! 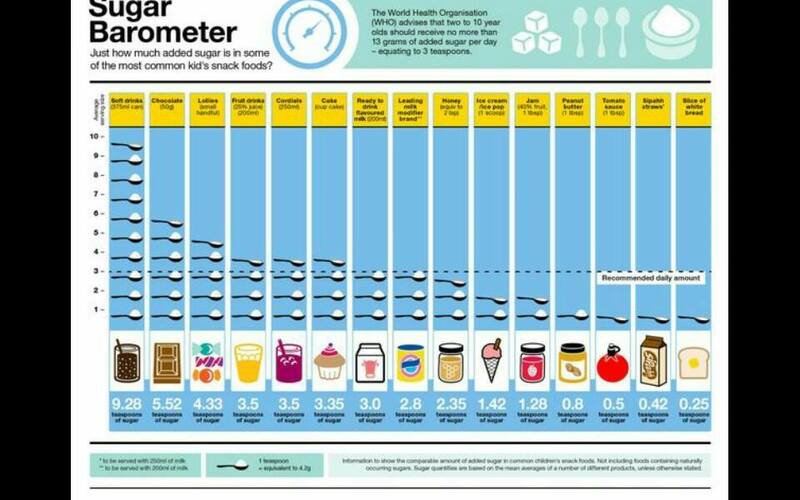 Sugar is Killing Us! Sixteen Reasons To Stop Eating Sugar – How Much Sugar and/or Acidic Sugary-Foods is TOO Much Sugar! How much ACID is too much ACID? Even one pack of the candy favorite M&M’s may be more than you should eat in a day, newly drafted guidelines from the World Health Organization suggest. A teaspoon of sugar in your coffee or a half cup of ice cream won’t kill you — all things in moderation — but the average sugar intake in the U.S. is 22 teaspoons per person per day. That’s almost four times as much as the WHO’s new guidelines suggest is healthy. People have been sounding warnings about the dangers of too much sugar for a long time. As early as 1957, John Yudkin, a professor of nutrition at Queen Elizabeth College in London, began arguing that when it came to heart disease and other chronic ailments, sugar — not fat — was the culprit. Trust your dentist on this one: Sugar is a metabolic acid and ad enemy to dental health that one study way back in 1967 called it the “arch criminal” behind cavities. The connection between the metabolic acid sugar and cavities is perhaps the best established. “Tooth decay occurs when the bacteria that line the teeth feed on simple sugars, creating acid that destroys enamel,” Anahad O’Connor explains at The New York Times. Because acid is a key culprit, sour candies are especially nefarious. Other than adopting a completely sedentary lifestyle, there are few routes to packing on the pounds that work as swiftly and assuredly as making large amounts of added sugars a staple of your daily diet. Sugary foods are full of acidic ingredients not will do little to satiate hunger. A 2013 review of 68 different studies found “consistent evidence that increasing or decreasing intake of dietary acidic sugars and sugary foods from current levels of intake is associated with corresponding changes in body weight in adults.” Want to lose weight? Cutting your sugar and acidic sugary food intake is a good place to start. When you eat a lot of high-sugar acidic meals — donuts for breakfast, anyone? 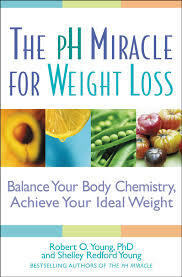 — it can increase your body’s demand for insulin, a hormone that helps your body convert food into usable energy. When insulin levels are consistently high, your body’s sensitivity to the hormone is reduced, and the acidic metabolic waste product glucose builds up in the blood. Symptoms of insulin resistance can include fatigue, hunger, brain fog, and high blood pressure. It’s also associated with extra weight around the middle. Still, most people don’t realize they are insulin resistant until it develops into full-blown diabetes — a much more serious diagnosis. Between 1988 and 2008, the prevalence of diabetes in the U.S. increased by 128%. Diabetes now affects about 25 million people in the U.S. — that’s 8.3% of the population. One study that followed 51,603 women between 1991 and 1999 found an increased risk of diabetes among those who consumed more acidic sugar-sweetened beverages — that’s soda, sweetened ice tea, energy drinks, etc. And a massive review of previous research involving 310,819 participants supported this result, concluding that drinking lots of soda was associated not just with weight gain but with the development of type 2 diabetes. Portion control may be especially crucial when it comes to sugar. “Duration and degree of sugar exposure correlated significantly with diabetes prevalence … while declines in acidic sugar exposure correlated with significant subsequent declines in diabetes rates” — even after controlling for other socioeconomic and dietary factors, concluded a 2013 study of eating habits and diabetes prevalence in 175 countries. Obesity is one of the most-cited risks of excess acid or sugar consumption. Just one can of soda each day could lead to 15 pounds of weight gain in a single year, and each can of soda increases the odds of becoming obese, a JAMA study noted. A handful of studies have found that high-sugar acidic diets are associated with a slightly elevated risk of pancreatic cancer, one of the deadliest cancers. The link may be because high-sugar acidic diets are associated with obesity and diabetes, both of which increase the likelihood someone will develop pancreatic cancer. Still, one large study published in the International Journal of Cancer disputed the link between increased sugar intake and increased cancer risk, so more research is needed. The idea that a high-sugar diet — and too much carbonic acid in soda in particular — may be a risk factor for kidney disease is still just a hypothesis, but there’s some reason for concern. “Findings suggest that sugary, carbonic and phosphoric acid soda consumption may be associated with kidney damage,” concluded one study of 9,358 adults. (The association emerged only in those drinking two or more sodas a day.) Rats fed extremely high-sugar diets — consuming about 12 times the percentage of sugar recommended in the WHO’s new guidelines — developed enlarged kidneys and a host of problems with regular kidney function. Hypertension has wrongfully associated with salty foods, not highly acidic desserts — but eating lots of added sugar has indeed been linked to high blood pressure. In one study following 4,528 adults without a history of hypertension, consuming 74 or more grams of sugar each day was strongly associated with an elevated risk of high blood pressure. Heart disease may not get as much time in the spotlight as diseases like cancer and AIDS, but it is in fact the number one cause of death in the United States. While smoking and a sedentary lifestyle have long been acknowledged as major risk factors. Conditions associated with excess sugar consumption, like diabetes and being overweight, are also already known risk factors for heart disease, and recent research suggests that eating too much sugar might stack the odds against your heart health — especially if you are a woman. In one study of rats with high blood pressure — which may offer clues for further research but can’t be directly extrapolated to humans — heart failure came fastest when they were fed a diet high in sugar (when compared to high-starch and high-fat diets). And a CDC study of 11,733 adults concluded that there is “a significant relationship between added sugar consumption and increased risk for CVD [cardiovascular disease] mortality.” When participants got 17% to 21% of their daily calories from sugar, they were 38% more likely to die from heart disease than those who limited their calories from sugar to 8% of their total intake. If you’re scarfing down lots of excess sugar, you’re probably skipping over the things you should be eating instead. “High-sugar foods displace whole foods (eg, soft drinks displace milk and juice consumption in children) and contribute to nutritional deficiencies,” noted a statement from the American Heart Association. In a study of 568 10-year-olds, as sugar intake increased, intake of essential alkalizing nutrients decreased. And in a 1999 study, researchers from the Department of Agriculture found that when people got 18% or more of their calories from sugar, they had the lowest levels of essentials like folate, calcium, iron, Vitamin A, and Vitamin C.
Gout used to be considered a disease limited to the rich, but as our acidic high protein diets have changed, this painful form of arthritis has become more common across all sectors of society. Certain foods like organ meats and anchovies that are associated with gout have high levels of something called purines and when your body breaks them down, it produces uric acid. A buildup of uric acid is what often leads to this acidic conniption of gout. 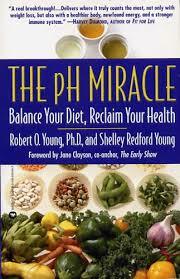 Reversing Atrial Fibrillation, CHF, Hypertension, Hypercholesterolemia, Diabetes, and even Alzheimer’s with Dr. Robert O. Young’s pH Miracle Self-Care to a Self-Cure for Heart Disease! 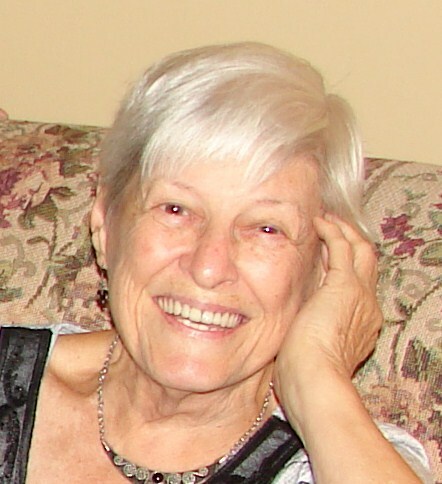 The following beautiful story comes from a loving and caring daughter, Jeri, who shares her 82 yr old Mother’s reversal of Hypertension, Hypercholesterolemia, Congestive Heart Failure, Atrial Fibrillation, and even Alzheimer’s! And, she no longer wears diapers! “One Lucky Gal! My mother Beverly Harris (82) has had an amazing transformation. I have been intensely cradling and nurturing mom since May 2013 as I have her following Dr. Robert O. Young’s pH Miracle alkaline protocol. Two years later she is once again able to read books, do crossword puzzles, prepare some food dishes, participate in Silver Sneakers and often walk up to a mile a day. Mom and Dad had lived with my family in an in-law arrangement from 2000-2010 when I decided to move them into an independent community living situation. Dad age 80 passed within 3 months. Several times a week I drove 90 minutes to see Mom for 1-1/2 years, she was failing fast with uncontrolled diabetes, congestive heart failure, and severe dementia. 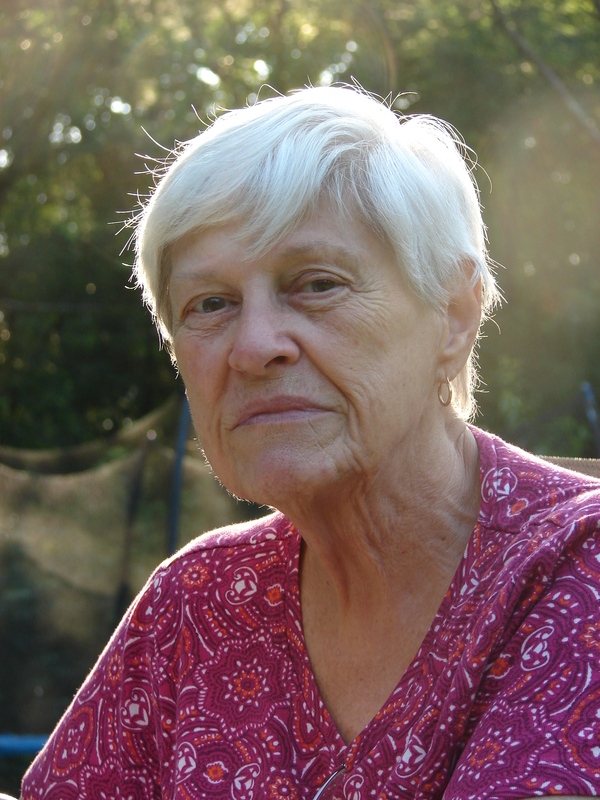 While at a doctor’s visit in May 2013, her heart was in atrial fibrillation and they called an ambulance immediately. After drug therapy and a roller coaster of trial medications, Mom came home to live with me again, she was despondent and unable to care for herself. Wearing diapers, she rocked in a chair and tapped her fingers often dazed in a fog, unable to spit her words out, unable to even watch TV, her eyes were empty… all the while I tried to regulate her 11 medications, which induced severe acidic side effects, from bleeding profusely, sleeping all the time and worsening mental issues. 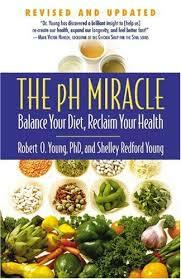 I decided I would try to put her on Dr. Young’s pH Miracle healthy supplementation program and change her acidic diet. I had to stop work completely, sell my office condo to stay afloat to relieve me of the burdening costs. The other day mom was teary-eyed with joy as we were setting up a kitchen area so she could make her own food. Mom went off all her 11 medications except insulin, but she reduced the insulin from 60 units a day to 16. Her blood pressure is perfect; she slimmed down and looks wonderful for her age. She can even fold clothes!!! Sounds silly but that takes a lot of skill and training. Here is a picture of her now after following Dr. Young’s pH Miracle for (reversing) Heart Disease lifestyle and Diet! She is bright, shining, happy and aware! Even though having to live on a shoestring budget, we manage to pamper her along with the pH MIracle diet changes and exercise. She gets monthly massages, facials, manicure and pedicures, too. Touch is so important! Although I know that I will never be able to leave her alone, this journey is a short one for both of us and the experience in reversing all her dis-eases with the pH Miracle protocol and her being virtually drug-free is a beautiful blessing!” If you are suffering from any symptom of heart disease you NOW have the blessing to change your life and save your life with a self-care to a self-cure following Dr. Young’s pH Miracle for reversing Heart Disease! NOW Is The Time To Change Your Life and Save Your Life! 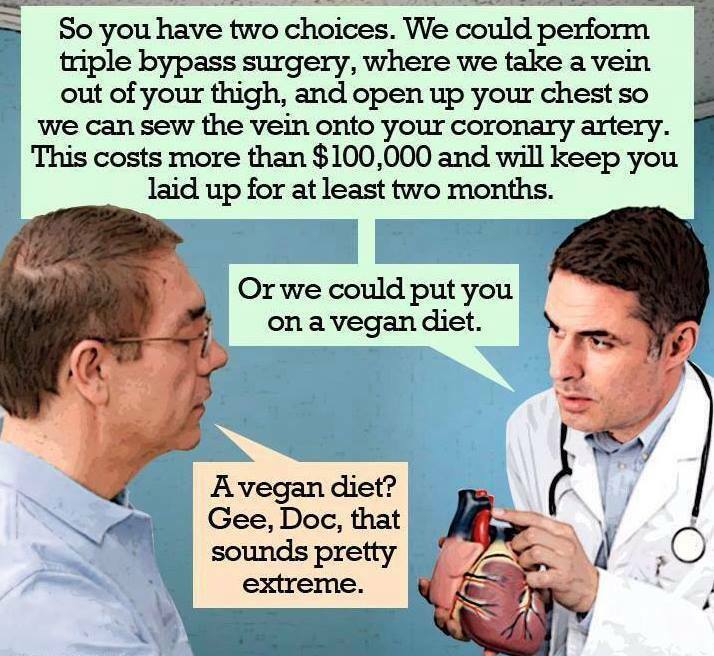 The longer that a person has had heart disease and hardening of the arteries, the more challenging it is to reverse. In some cases, the damage will be too severe to completely eliminate, but stopping the progression and reversing it partially is possible in even the worst cases. Hawthorn has been proven to help those with congestive heart failure, pulse irregularities, and angina. It is the most recommended supplement for heart health, in both alternative and mainstream medicine. Hawthorn is considered to be the swiss army knife of heart supplements. According to the University of Maryland Medical Center, hawthorn has been used since the 1st century as a remedy for heart and respiratory ailments. In Germany, it is regularly prescribed by mainstream doctors to those with heart failure or hypertension. Hawthorn also reduces the likelihood of blood clots, and has a strong anti-inflammatory/anti-acid effect. The research study, Alternative Therapies: Part II. Congestive Heart Failure and Hypercholesterolemia, aggregated the results of 50 clinical trials. It was performed by the Louisiana State University School of Medicine. It concluded that a “clear improvement in the subjects receiving hawthorn was observed”. The standard dosage in the studies was 500 mg. per 100 lbs. of body weight. Perform a heavy acid and metal cleanse. Those with heart disease generally have a history of heavy acids and metal toxicity, and the difference that a heavy acid and metal cleanse makes can be dramatic. As noted earlier, always begin with a thorough liver cleanse. When heavy acids and metals are removed from the connective and fatty tissues, the body can properly create nitric oxide. 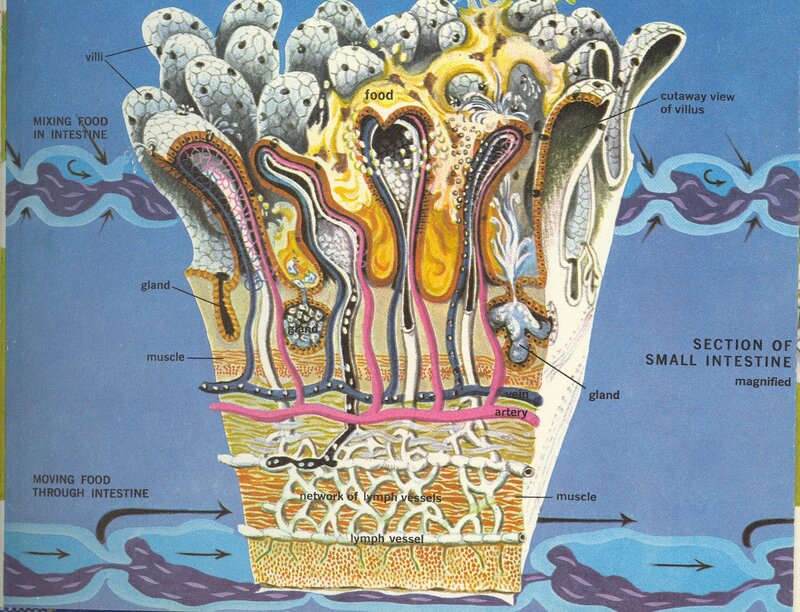 Nitric oxide allows vessels to expand and contract efficiently, and it allows greater oxygen into cells. Toxic elemental iron accumulation inside the blood is a problem specific to men. Therefore, adult males should never use supplements containing elemental iron. Men develop an excess of elemental iron in their bodies because of male acidic hormones like testosterone, and because the male body will not remove excess elemental iron without proper alkalizing nutritional augmentation. The typical resultant iron excess in males is believed to be one of the main reasons why men die younger than women. The bodies of females of child-bearing age flush excess elemental iron through their menstrual process, which acts as a natural blood-letting. A woman’s remaining iron reserves are then used to produce replacement blood. Donating blood is the quickest way for a man to reduce his iron levels, and it may therefore save two lives. The study, A Historical Cohort Study of the Effect of Lowering Body Iron Through Blood Donation on Incident Cardiac Events, has shown that men who give blood have a 30% reduced risk of heart disease. An unusual but potentially effective option is to occasionally supplement with colloidal silver, for silver is able to neutralize iron in the body. Dr. Linus Pauling discovered that resveratrol, found in grape skins, aids in the removal of iron. Resveratrol can also directly reverse plaque deposits. A study by the University of Wisconsin found that when people with coronary artery disease drank 20 fluid ounces of purple grape juice for just two weeks, their blood vessels became noticeably more elastic, and both platelet aggregation and LDL oxidation decreased. Due to its resveratrol content, wine consumption has been identified as one of the primary reasons for France’s low rate of heart disease. In perhaps the greatest irony herein, unprocessed whole mineral salt is needed to reverse heart disease. Natural salts are needed because of the trace minerals that they contain, which are not attainable by any other means. I recommend that readers replace all table salt with mineral-rich unprocessed sea salt. Do not buy the fake sea salts from regular grocery stores, because they are just as refined as the table salts, and are thereby counterproductive. True sea salt should never be a bright white color. Always avoid these salts. Use unrefined, non-adulterated, mineral-rich sea salt that can be purchased online or from a health food store. Liberal amounts of natural sea salt up to 14 grams a day based on a body weight of 70k or 154 lbs. 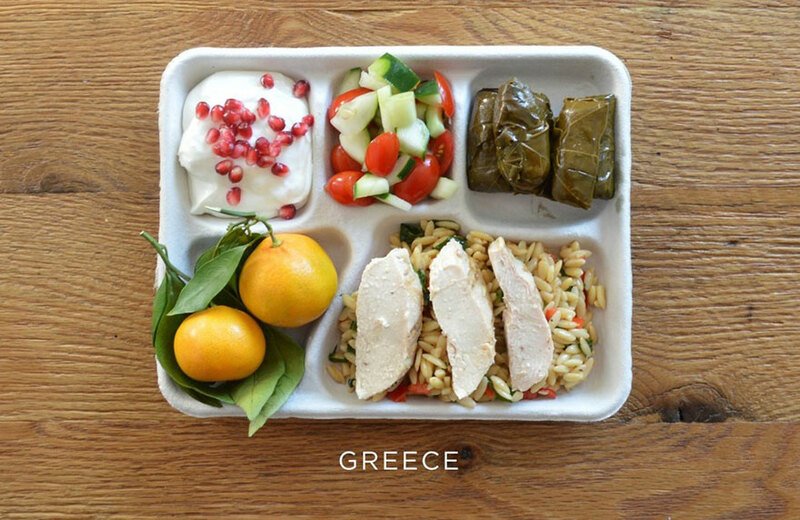 should be added to alkaline meals as a healthy and flavor-enhancing supplement. The human body can create new arteries when its old arteries become clogged, but it needs new healthy blood and copper to accomplish this. Oral supplementation with copper is dangerous, because it quickly becomes toxic with an overdose, and it takes only a tiny amount to overdose. Excessive amounts are known to cause severe organ damage; especially to the kidneys and liver. Therefore, I discourage people from orally consuming any man-made copper solutions, such as colloidal copper or copper hydroxide. So get your copper from a good unprocessed mineral salt. For the sake of safety, copper should only be supplemented by way of the following nutritional methods. Natural sea salts contain safe amounts of natural copper and important trace minerals. Another option is non-glycerin chlorophyll extract, which will have the additional benefits of increasing the number of red blood cells, increasing blood oxygenation, protecting against radiation, and neutralizing benzene compounds. It contains much more copper than sea salt. 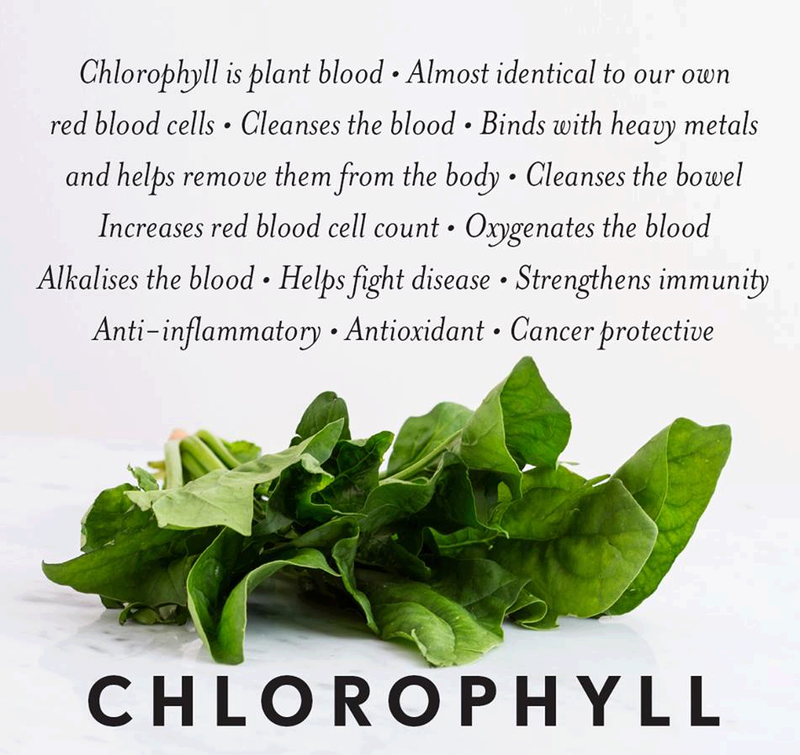 Chlorophyll is the dark green pigment of plants and vegetables, but it can be purchased in a concentrated extract for supplementation. 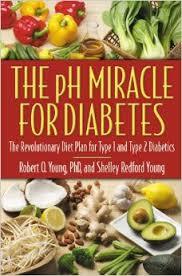 It is a recommended supplement for all heart disease, cancer and diabetic patients. In liberal amounts, chlorophyll safely gets large amounts of copper into the human body. You cannot drink too much. Avoid all processed foods. They contain excessive amounts of sodium from dangerous sources, such as monosodium glutamate. MSG is especially dangerous to the heart, because it neutralizes L=taurine, which is necessary for pulse regulation. Monosodium glutamate intake in combination with deficiencies of both magnesium and L-taurine can make MSG deadly. This combination is the cause of many unexplained heart attacks in otherwise healthy people; including young athletes in their prime years, whose only mistake was that last meal at K.F.C. 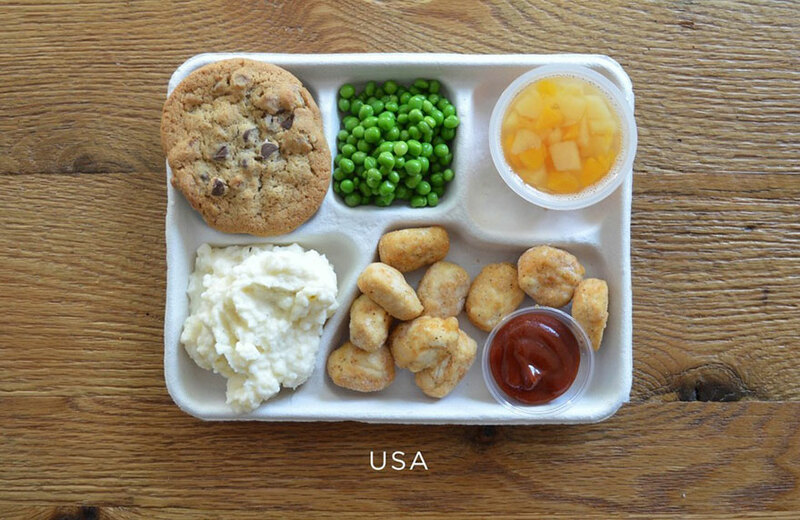 (Kentucky Fried Chicken). 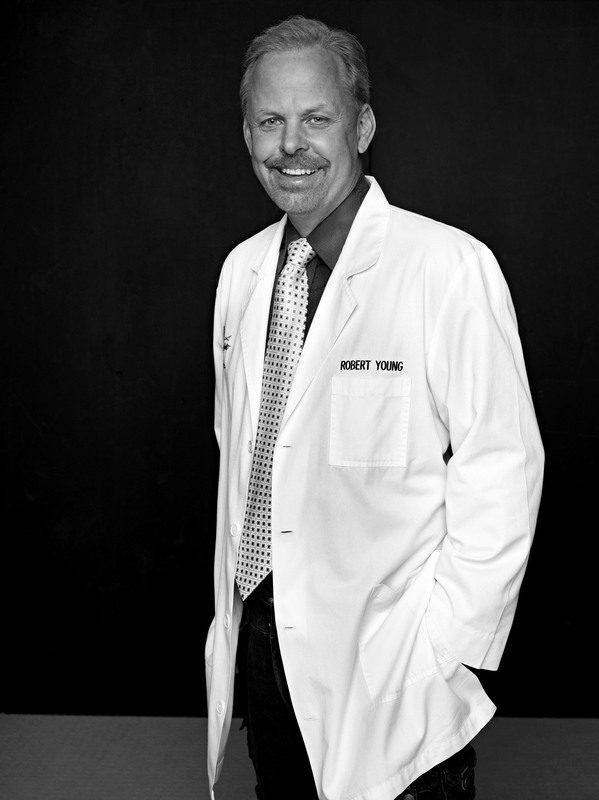 Dr. Matthias Rath, M.D., is a leading researcher of heart disease, who worked with the late Linus Pauling. He has continued much of Dr. Pauling’s work. Dr. Rath explained that the first step in reversing coronary heart disease is nutrition, and people with coronary heart disease are deficient in trace minerals. In particular, vitamin C supplementation is essential. In his book, Why Animals Don’t Get Heart Disease, But People Do, Rath explained that the only other species to get heart disease is the guinea pig, and it is also the only other species that does not internally produce its own vitamin C. Hardening of the arteries is a pre-scurvy condition, and it will occur if not enough vitamin C is available. The two doctors proved that vitamin C also bonds with iron, allowing excess iron to be removed, it suppresses cholesterol oxidation, and it shields the body against metabolic and dietary acids. Niacin (vitamin B-3) and pantothenate (vitamin B-5) work in conjunction with vitamin C. Niacin protects the arteries, and is metabolized in the body from L-tryptophan. 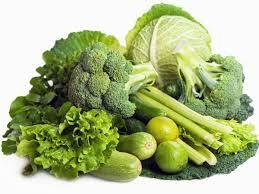 L-tryptophan naturally occurs in all green vegetables, but can also be obtained through supplementation. It is recommended that people avoid time-released niacin, because too many people have had bad experiences, including blackouts and hallucinations from the chemical impurities. Both niacin and L-tryptophan are effective for treating depression, and this again reinforces the connection between emotional and heart health. Vitamin B-5 (sold as “pantothenic acid”) works with vitamin C to protect against arterial damage, thus reducing a body’s overall need to produce cholesterol. Vitamin B-5 can be found naturally in vegetables, grasses, sprouts, and legumes. 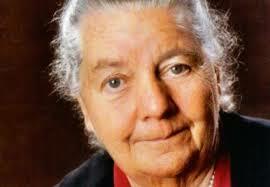 In the 1950’s, Dr. Johanna Budwig was reversing heart disease with what is now known as the Budwig Protocol. 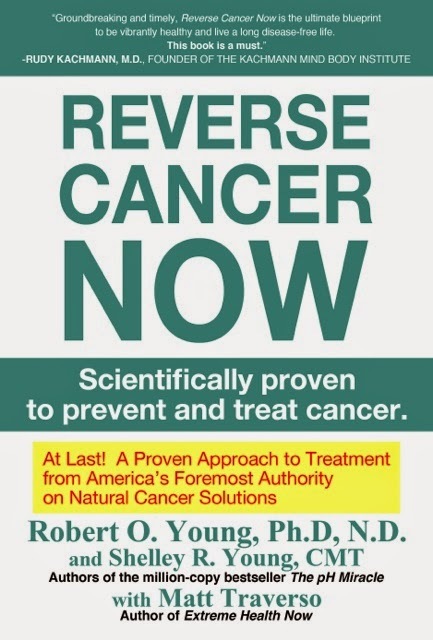 However, this alternative protocol is much more famous for reversing cancers, and there is a strong connection between the two inflammatory disease states. At the core of the anti-inflammatory/anti-acid pH Miracle protocol is a combination of flax and hemp seed oil and a food item that is rich in chelating antioxidants. I have discovered that maximum absorption of omega-3 into cells is required to buffer intracellular acids. Whenever properly combined, this solution is best able to penetrate into the deep tissues and through cellular membranes. Flax and hemp seed oil supplies the building blocks for cellular repair, helps dissolve excess acid-bound cholesterol inside the arteries, balances the high omega-6 concentrations that are found in trans-fats and processed foods, increases cellular energy, increases the efficiency of respiration, and it is an overall tonic to general cellular functions. The heart benefits of flax and hemp seed oil (omega-3 supplementation) are now well-recognized, even by orthodox medicine. Whenever flax and hemp seed oil is heated or exposed to air, it rapidly becomes rancid, and thereby harmful. People should avoid products which contain heated or exposed flax and hemp seed. This often includes cereals, breads, and flour. The companies that sell these products deceptively promote them as being healthier, but ironically, most of the omega oils have been destroyed by the processing, and any remaining oils have become inflammatory and carcinogenic. The medical establishment has sabotaged alternative medicine’s otherwise beneficial pH Miracle Protocol into being something less than beneficial. Instead of following the original protocol that uses flax and hemp seed oil as the source for omega-3 supplementation, the medical establishment prescribes fish oil to heart disease patients, which has been industrially processed by the pharmaceutical industry with high-heat and poisonous chemical solvents to extract the oil from fish livers. The livers of fish are where the PCB’s, heavy metals, and pesticides are stored; because such substances are too toxic for their digestive and immune systems to excrete normally. A liver is a body’s toxic waste dump, in other words. 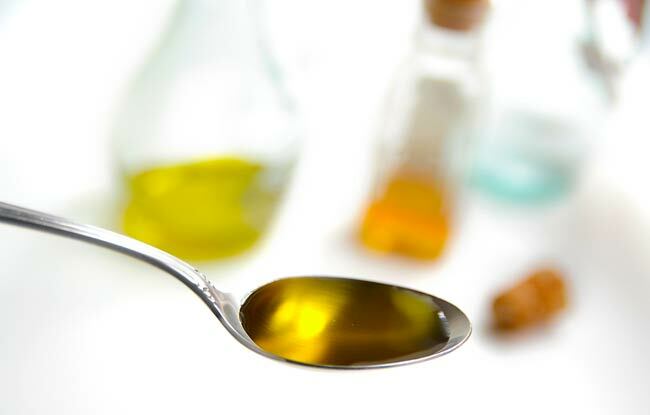 The high heat and extreme processing that is used to chemically extract the omega oil from fish livers means that the derived oil is always rancid by the time that it reaches the patients; and therefore, this doctor-prescribed ‘medicine’ actually causes heart disease and cancers. Most of the fish that are used to pharmaceutically produce omega oil have high amounts of the inflammatory omega-6 and very low amounts of omega-3, because the pharmaceutical industry’s fish are farm-raised in unhealthy conditions in Chinese fish farms. Adding an even greater insult to the injury, American patients are charged hundreds of dollars for this impure and carcinogenic version of omega-3 by the medical industry, while the safe and more effective equivalent (flax and hemp seed oil) can be found cheaply at any health or natural food store. Health or natural food stores also sell fish oil, but it too should be avoided in lieu of the superior flax and hemp option. Co-enzyme Q10 is absolutely essential for recovery from heart disease and heart failure. It can be found in some foods (particularly avocado) and it is produced by the body during exercise. While studies have shown great benefits through intravenous supplementation, oral supplements are unfortunately not absorbed well. 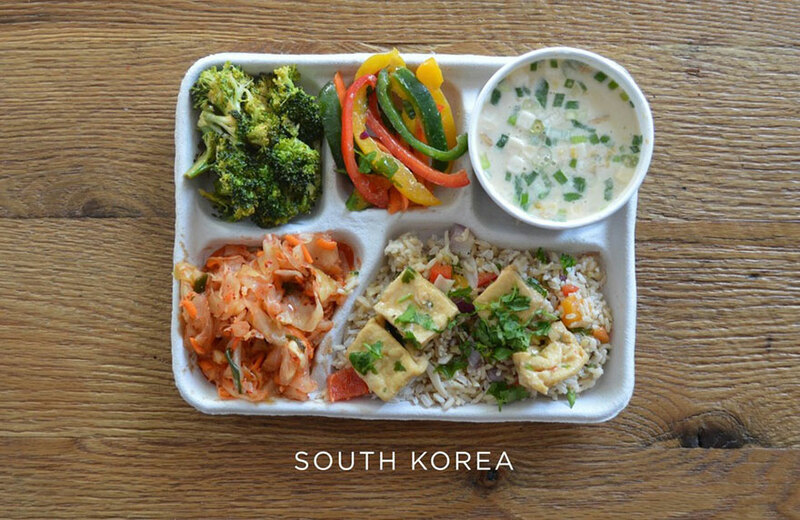 Thus, it must be obtained through dietary sources and exercise. CoQ10 is essential for the emulsification of fats. It also lowers the blood pressure and provides an increased chance of survival following cardiac arrest. Research has also found that those with gingivitis have a deficiency of CoQ10. Vegetarians may attempt supplementation, even though absorption will be very low. Nevertheless, even a small amount will be helpful. 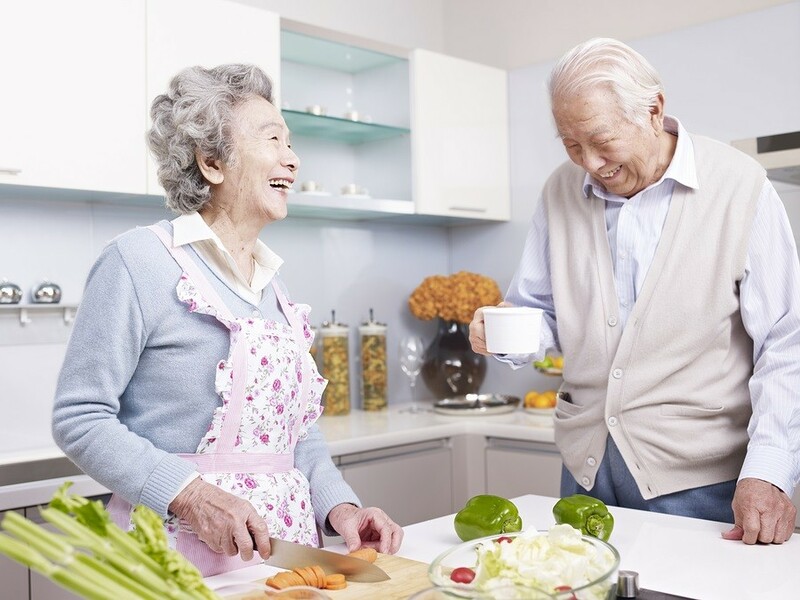 Japan currently has the lowest rate of heart disease in the world, so it is logical to examine their dietary and medicinal practices, in order to adopt them into our own society. The Japanese eat lots of fish, and thereby get large amounts of vitamin D, omega-3, and safe iodine. In addition to that, whenever heart disease is diagnosed, L-taurine is a common recommendation by Japanese doctors. Taurine is a natural nutrient, which makes it unpatentable (unprofitable), so it is “not approved” for medical use in the United States. It can stabilize the heart rate, neutralize MSG, and it helps the body to better regulate potassium, calcium, and sodium in the body. It is known for its ability to protect the kidneys from damage. L-Taurine supplementation has also been shown to reverse some of the damage caused by smoking, even amongst smokers who continued smoking during the clinical trials. A 2003 study by the Royal College of Surgeons found that damage caused by chronic smoking can be reversed in as little as five days with a dosage of 1.5 grams of L-taurine. The inner lining of the blood vessels and the diameter of blood vessels returned to normal in the study. It is wise to take anti-inflammatories or anti-acids when attempting to reverse heart disease. As already stated, inflammation is the first step in arterial plaque. Effective natural anti-inflammatories or anti-acids include devil’s claw, vitamin C, MSM, cherry concentrate, and resveratrol. Curcumin, a component of the turmeric spice, is also an anti-inflammatory and it has the added benefit of reversing some arterial plaque. Never underestimate the benefits of culinary spices, which are sometimes known as herbal medicine. I have already written an entire article about the benefits of cayenne pepper, and it is absolutely vital for people with heart problems. 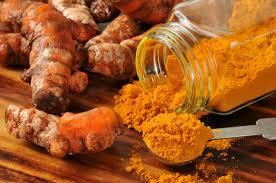 It aids circulation, stabilizes blood pressure, and it can actually stop a heart attack in its tracks. Seriously. Remember this, because cayenne pepper can save a life. This is especially true whenever it is mixed with L-taurine. The suffering patient may need to hold them in his mouth for fastest results. During a heart attack, nobody ever complains that something tastes too spicy. Cayenne pepper is even good for painless weight loss. It can be conveniently supplemented in a pill form that is available from health food stores. We recommend that everyone with heart problems supplement with cayenne, or put it into a tea daily. Dr. David Christopher has been labeled “Dr. Cayenne” for his endless promotion of this spice. Another reason for solidification of acids inside the arterial walls is an excess of blood-borne calcium, which is typical in Western nations. Vitamin D and magnesium chloride are critically needed for a body to make proper use of its calcium, so that it does not simply get dumped onto the artery inner walls. A large portion of people are not able to properly assimilate vitamin D supplements, so it is best obtained through sunlight. 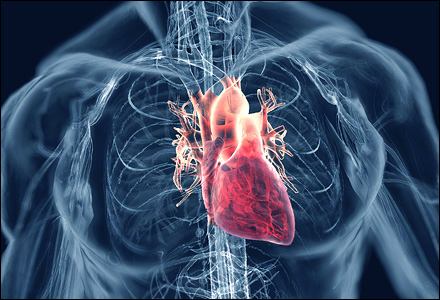 It is important that you reduce or eliminate nicotine in cases of severe heart problems. Nicotine, along with alcohol, caffeine, and a host of pharmaceuticals, interferes with the absorption of key nutrients, which are vital for recovery. If you must smoke, ensure that you are making your own cigarettes with organic tobaccos and a rolling machine, or else you will be inhaling a host of chemicals including (but not limited to) carpet glue. 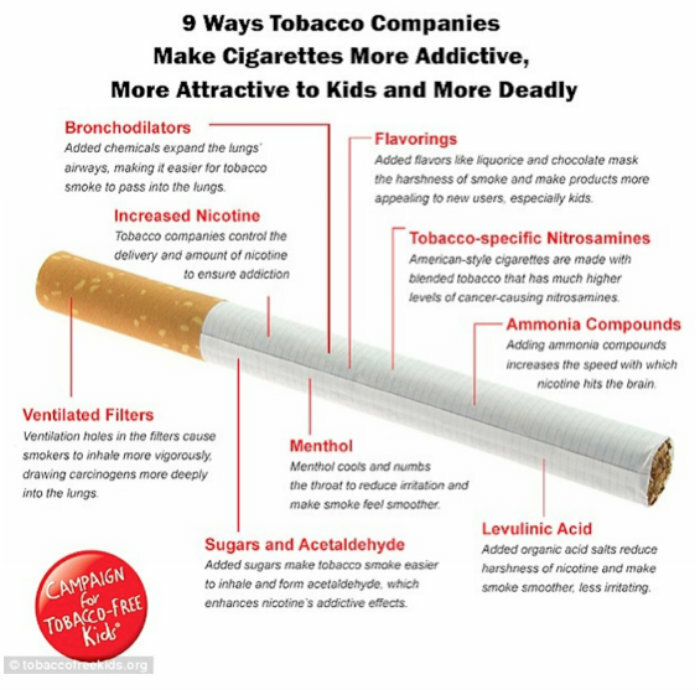 Modern cigarettes have intentionally been made much more harmful than they need to be by the chemical industry, and they are fertilized with radioactive fertilizers. Indian tobacco can help eliminate a large number of addictions, including nicotine, and it can also help to clean the lungs. Almonds and hazel nuts lower the heart disease risk because they contain alpha-linolenic acid (LNA). It is an omega-3 fatty acid. 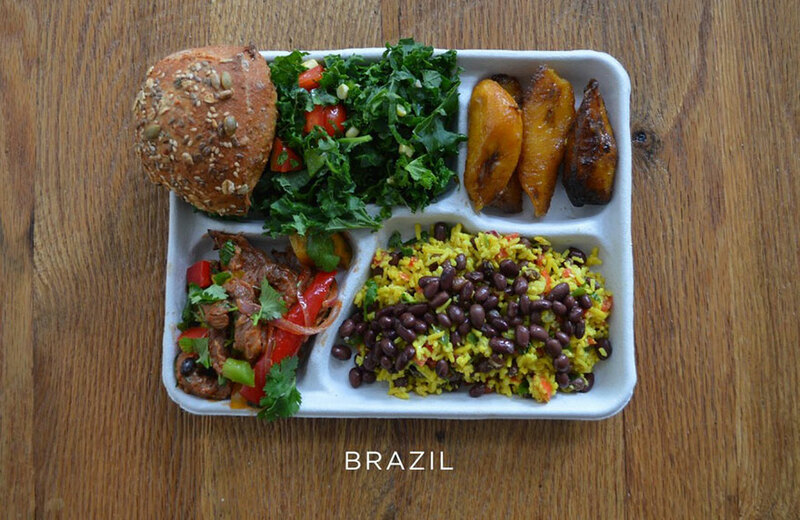 Countries with the most LNA in their diets also have the lowest risk of heart disease. Walnuts and cashews are the most nutritious nuts available. Peanuts contain the least amount of nutrients, are likely to have pesticide residues and contain molds and mycotoxins. Ginkgo biloba improves circulation, and it reduces cholesterol concentrations in the arterial walls. It also enables the arteries and veins to more fully relax between pumping cycles. The National Institutes of Health reported that ginkgo is very useful for alleviating leg pain that is attributed to blocked arteries. Exercise is essential for preventing heart disease or recovering from it. Not only does exercise allow the body to create its own CoQ10, but it also creates nitric oxide and L-carnitine. As already stated, nitric oxide from an amino acid called L-arginine aids the vessels to expand and contract more efficiently, and L-carnitine can improve the heart’s function. We recommend finding an exercise that you can enjoy, and if possible, do it with others. Try to remember how enjoyable exercise was when you were a child, and attempt to make it that way again. Let us not forget that positive emotions are vital to heart health. Jogging on a treadmill is a chore, and it can even be a humiliating, demeaning experience. I personally enjoy rebounding, walking, jogging and static contraction weight-lifting. 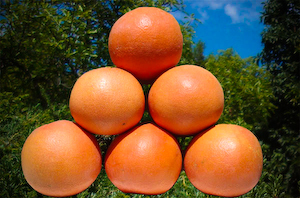 Grapefruit and especially grapefruit pectin is available in supplement form. 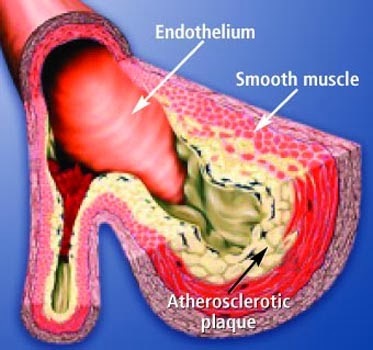 It reverses arterial plaque, reduces cholesterol, and widens the arteries. While it is not a standard supplement, we would nevertheless recommend it to anyone with chronic heart problems. Due to the importance of nutrition, I recommend that people follow my pH Miracle green juice feast for about two weeks when they are strong enough. 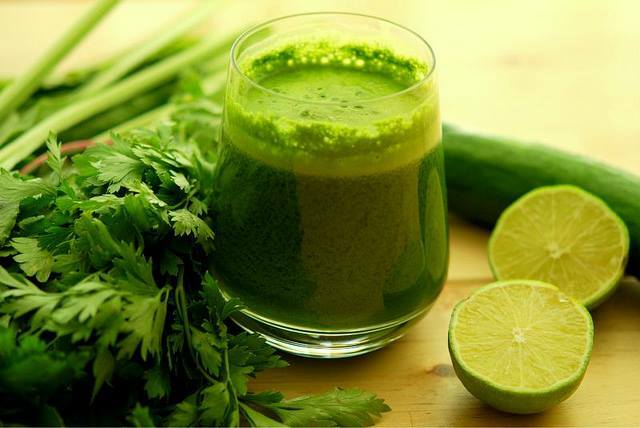 Juicing is the process of mixing alkaline fruit and vegetables together in a blender or juicer, and then using the extracted juices as a food source. A juice fast is a means of flooding a body with alkalizing nutrients that it is normally lacking in due to our modern diets. The first few days may be difficult, but the long-term benefits can be dramatic. I recognize that many people perceive they require a source of pure protein each day (such as organic hemp seed or hemp protein which is one of the best sources) to be able to continue with their normal lives uninterrupted. The need for protein in the diet is less than 5 grams a day. The body is a great recycler and obtains all of its protein needs from within. Also, all body cells are made from red blood cells and red blood cells are made from stem cells developed in the crypts of the small intestines. 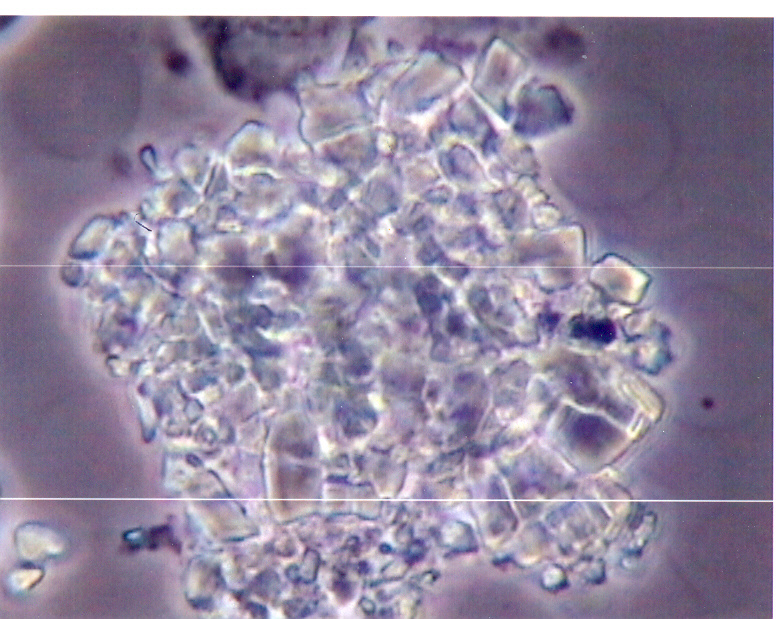 Stem cells are made from the liquid alkaline food called chyme. The quality of these stem cells is determined by what you eat, what you drink and what you think. 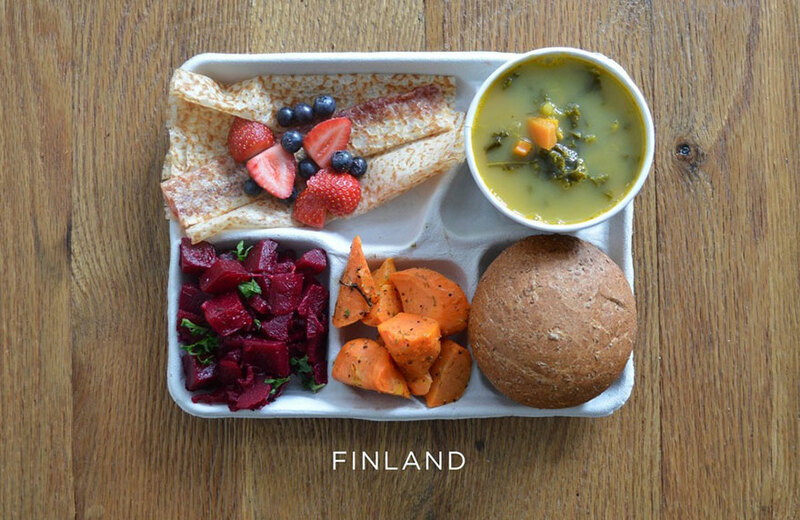 The fasting or feasting diet incorporating juiced and purred green vegetables, fruit, alkaline water, mineral salts and polyunsaturated oils is the key to producing healthy stem cells to red blood cells in mass. 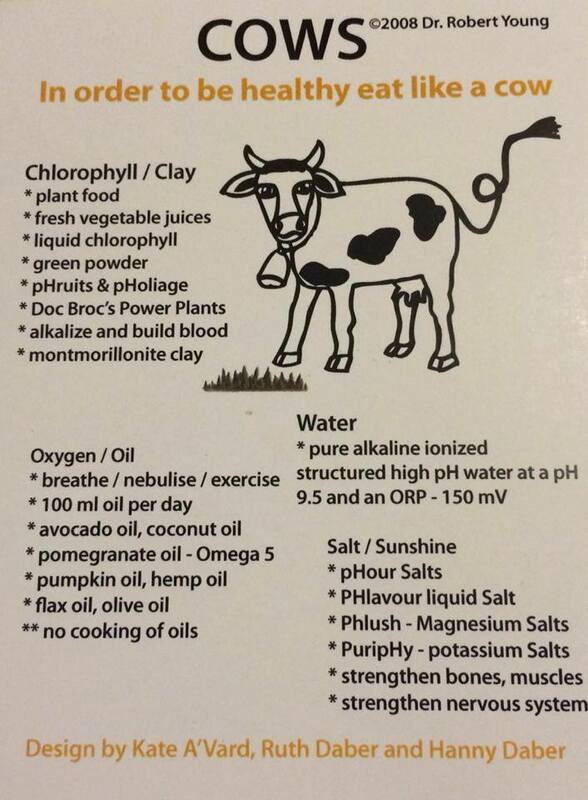 I call this approach to the restoration of energy, vitality, health and fitness to the body COWS. COWS is an acronym that stands for the four food groups required to increase stem cell production and to improve the quality of these stem cells produced. 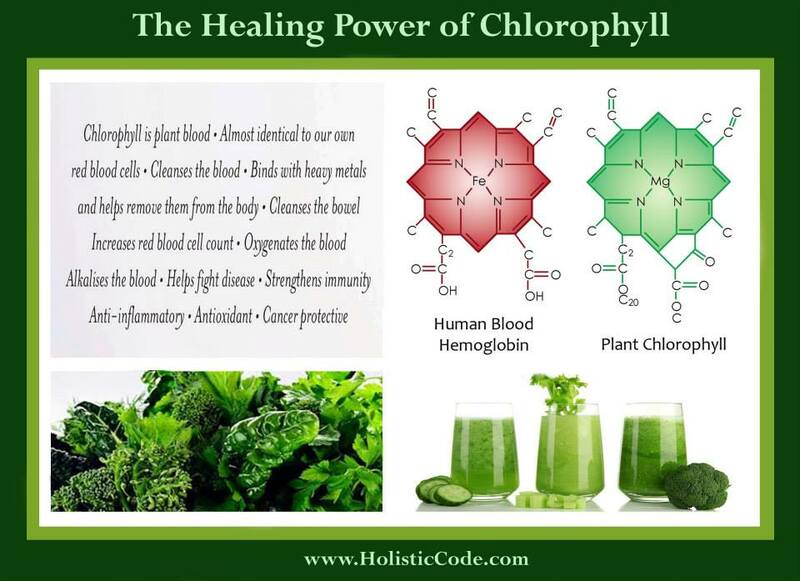 The ‘C’ stands for chlorophyll which can be found in all organic green vegetables and fruit which becomes the foundational light or life force of intelligence in the stem cells. The ‘O’ stands for oil and more specific polyunsaturated oils for building the lipid membrane of stem cells that holds the liquid light from the chlorophyll. The ‘W’ stands for water and alkaline water which provides the environment for stem cell for movement, intelligence and life. And finally ‘S’ which stands for salt and specifically sodium which is the basis for conductivity and the transport of electrical energy without and within the stem cell. The production of healthy stem cells requires a healthy alkaline pH at 8.4 in the crypts of the small intestines. As you increase the quality and quantity of stem cells in the gut you will increase the quality and quantity of your red blood cells throughout circulation. As you increase healthy red blood cells traveling throughout the vascular system you begin to replace unhealthy body cells with healthy biologically transformed red blood cells to brain cells, nerve cells, muscle cells, bone cells, liver cells, artery cells and new healthy heart cells. You replace and restore an unhealthy heart with a new healthy and youthful heart. 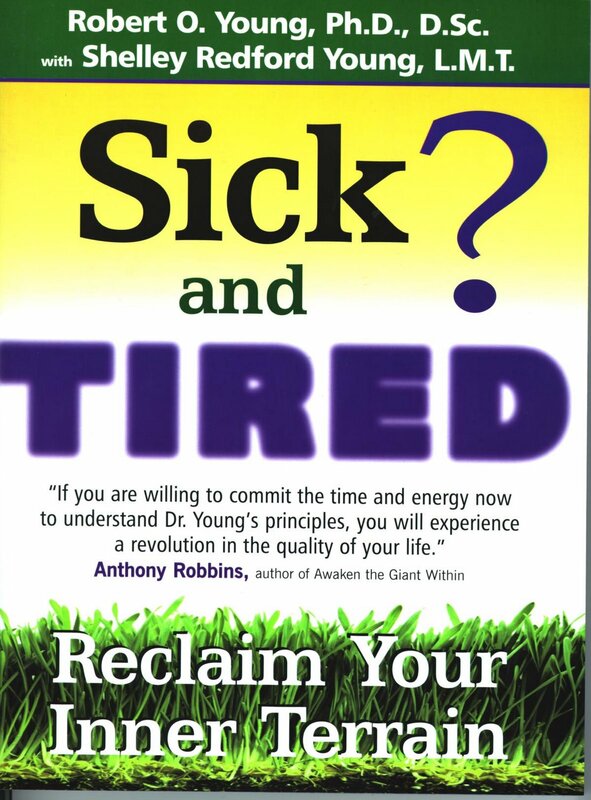 This is how YOU reverse ANY health challenge including the many symptoms of heart disease. Understand? Without Salt There is NO Alkalinity and There is NO Life! For years, doctors have been telling us that too much salt is bad for us. Until now! A recent study claims that cutting down on salt can actually increase the risk of dying from a heart attack or a stroke. 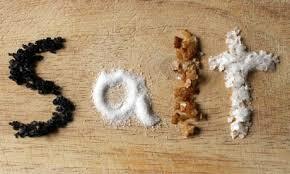 In the eight-year study, people with the lowest salt intake had the highest rate of death from heart disease! In fact, those with less salty diets actually had slightly higher death rates from heart disease. The study, which followed 3,681 healthy European men and women aged 60 or younger, for about eight years, also found that above-average salt intake did not appear to increase the danger of developing high blood pressure. The report, in the latest issue of the Journal of the American Medical Association, was released just three months after the U.S. government launched a public health campaign urging restaurants and food manufacturers to cut down on their use of salt. Sodium was measured in the urine of those taking part, at the beginning and end of the study. A little more than six per cent of the participants suffered a heart attack, a stroke or some other cardiovascular emergency during the eight years. About a third of these were fatal. Those who consumed the least salt had a 56 per cent higher risk of death from a heart attack or stroke compared with those who consumed the most. This was even after obesity, cholesterol levels, smoking, diabetes and other risk factors were taken into account. There were 50 deaths in the third of participants with the lowest salt consumption, 24 in the third with medium intake and just ten deaths in those with the highest salt levels. Lead researcher Jan Staessen, head of the hypertension laboratory at the University of Leuven, in Belgium, said: ‘Our findings do not support a generalized reduction of salt intake in the population. they reportedly speculated that low levels of salt in the body could cause more stress in the nervous system, decrease sensitivity to insulin and affect hormones that control blood pressure and sodium absorption. Bottom-line if you want to be healthy and prevent or reverse heart disease then you must increase your salt intake as you are decreasing your acid intake. As we said in the 60’s you have to stop “dropping acid!” if you want to be healthy. Back then and even now it was LSD! A toxic acid from mold called Ergot! If You want to get high? Get high on a life of feeling incredible! Throughout this article, I resisted the temptation to rant about the sorry state of cardiac medicine, if it can indeed be reasonably called medicine. I began by citing that the medical industry’s own statistics prove that standard medicine for cardiac issues is the single biggest failure of orthodox medicine. Now I end this report with an honest commentary about our well-earned biases against the status quo. Sometimes emergency medical personnel save lives with emergency medicine, but this is the best that orthodox medicine can do. They fail at everything else, and this is partly because effective therapies are illegal. All approved therapies must be drug-based, which means that all of the successful nutritional therapies (to what is a very nutritional problem) are forbidden to all doctors who wish to remain licensed to practice medicine. The consequence is that it is actually illegal for any licensed doctor to cure or to successfully mitigate heart disease, cancer or diabetes since successful and natural therapies are not approved by medical regulators. If you receive the standard treatments (chemical symptom suppression) for heart conditions, or the establishment’s supposedly preventative treatments, which usually do the opposite of what they are presented to do, then you will die of either heart disease, or the treatments themselves. There is a 70% risk that you will die of complications caused by the medications, such as the development of a cancer, or liver failure, or diabetes. They call this “progress”. 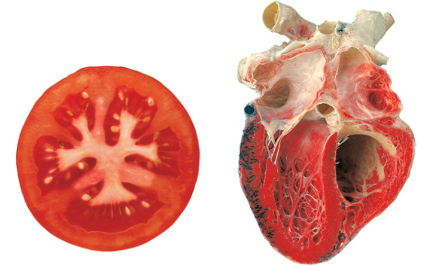 Heart disease is not truly normal or natural, and it is NOT genetic. The only thing that is genetic about our cardiac catastrophe is that lifestyles, family doctors, and eating habits are inherited. At the core of the problems are ignorance and irresponsibility that span generations. In this sense, there are genetic components to heart disease, but the problem was never God’s engineering. Heart disease takes lots of work to reverse, but it is more-or-less self-curable in most cases, regardless of what a doctor tells you. Remember that it took years to get yourself into this state of ill-health, and it may take a long time to get yourself out of it. Do not disregard the importance of emotional and spiritual health, because these things have a major impact upon the heart, and a full recovery may not be possible otherwise. Whenever I use the term “spiritual health”, I are referring to real spirituality, such as forming a personal relationship with our Creator. Americans need not be concerned with legalities when trying to employ these methods. Every State in America has a Good Samaritan law, which provides special legal protection to those who make a good faith effort to save a life! My hope after you read this article is that you will do your own research and find out for yourself as I have that there is a Self-Care natural health and wellness protocol for a Self-Cure for Heart Disease! 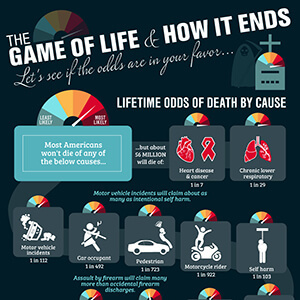 The Game of Life and How it Ends! The Game of Life and Death! Let’s see if the odds are in your favor. Most Americans won’t die of any of the below causes. Assault by firearm will claim about a 890,000 (1 in 356). Much more than accidental firearm discharges, which clocks in at 48,000 (1 in 6,509). There’s a chance you’ll be on the street. Though the chances of just furniture (1 in 1,346,153) or appliances crushing you (1 in 2,025,641) are much more slim. 65+: Heart disease, malignant neoplasms, cerebro-vascular, chronic low respiratory disease, alzheimer’s disease, influenza/pneumonia, diabetes melititus, nephritis, unintentional injury, septicemia. That’s 1 in 145 whose time is up, every year. Such is the game of life! I Am No Longer A Dead Zombie!